The chained bars worked inside the paisley was outlined in linked chain stitch and the inner paisley was outlined in back stitch. 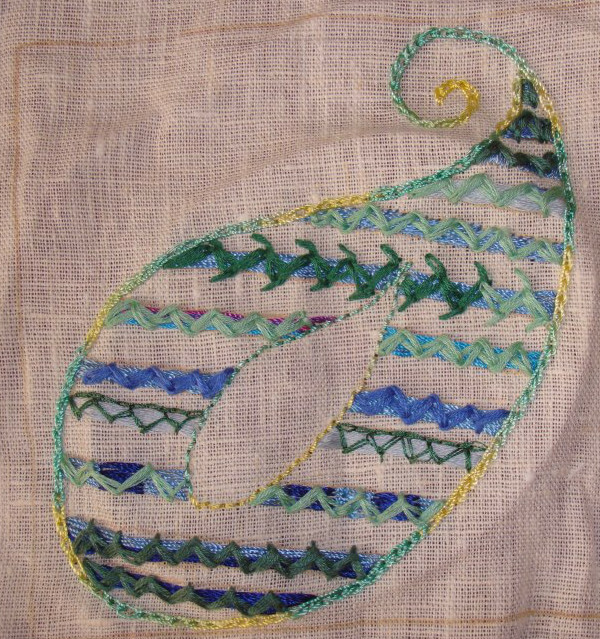 The zigzag chain stitch was worked in metallic thread in this part over diamond shapes worked in perle cotton. It was interesting to work the sequins on this piece. Zigzag chain worked over ribbon was an idea which did not find any place in this piece. 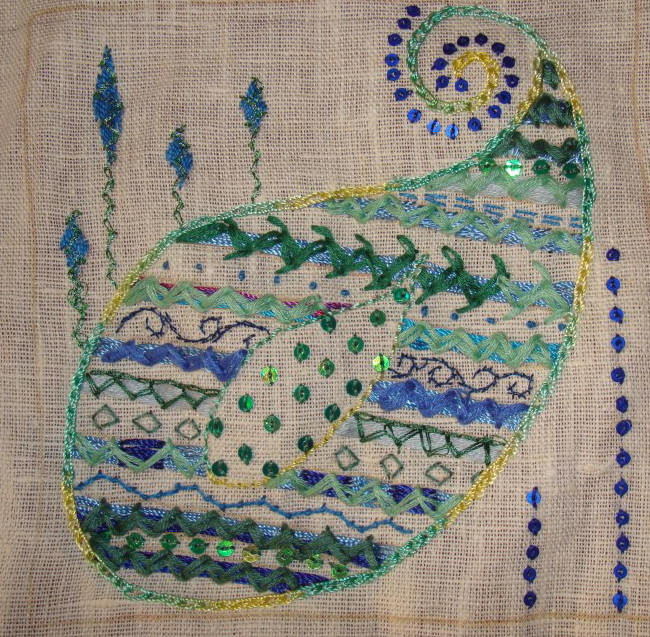 I need to catch on the next TAST stitch, Paisley again? I wonder. The studio journal class is on its third week, I am presently overwhelmed at the ideas presented by Sharon there, and having some starting troubles. Back to routine after ten days in Chennai, India. 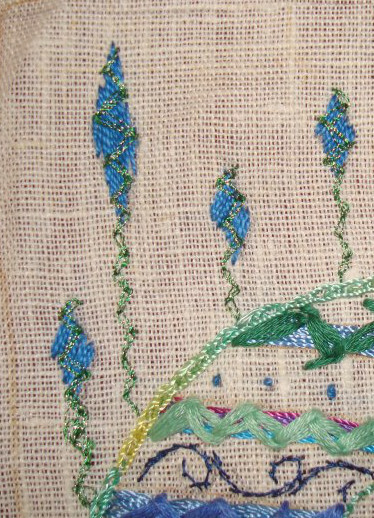 The working of this stitch is on Pin tangle. Paisley has surfaced again on the TAST challenge. This piece was started before I left for holidays. Did not have time to even open the box of WIPs the whole time in Chennai. The idea is to fill the paisley design with chained bar. 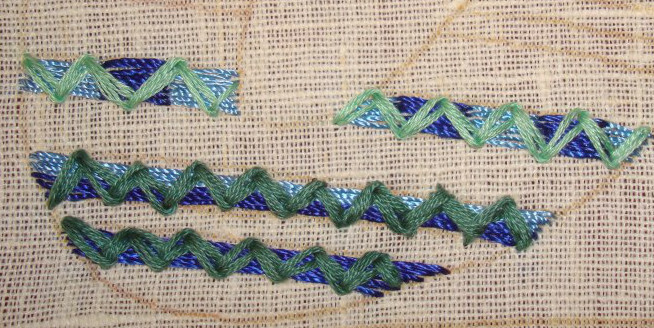 Starting with dark blue, and mixing dark and medium blue, the lines were filled with surface satin stitches. 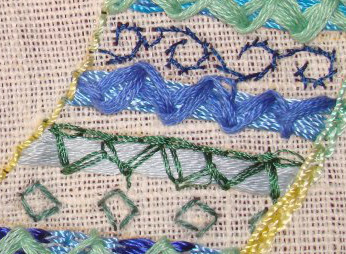 The zigzag chain stitch was worked in dark and light teal cotton skeins. 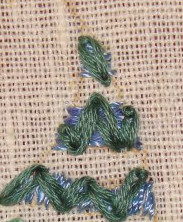 After working the surface satin stitch in light, medium blue and variegated threads, the zigzag chain stitch was worked in dark teal with chain stitch outline, blue and light teal. 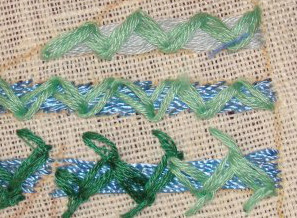 After working the chained feather over the surface satin stitch in the bottom row, the zigzag chain stitch was worked in light teal cotton skein over medium blue polyester [slanted surface satin] and light blue cotton skein. Continuing- The narrowed space inside the paisley was also worked in chained bar. This was done yesterday.